In January of 2012, the Texas Rangers investigated a Department of Public Safety (“DPS”) Crime Laboratory technician, Jonathan Salvador, for allegedly tampering with crime lab evidence. The Rangers questioned DPS technicians and reviewed evidence records, bringing information that pointed to Salvador’s mishandling of lab results to Harris County’s District Attorney’s office. However, after an extensive investigation, the grand jury did not indict the technician. 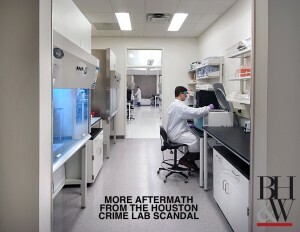 Subsequently, the DPS Office of Inspector General issued a report, stating that Salvador “failed to properly follow laboratory protocols…misidentified substances, and dry-labbed [falsified] samples.” Following the report, Salvador was terminated from his position at the Houston Crime Lab. The fallout from Salvador’s actions, “call…into question the veracity and reliability of many cases handled by Salvador…[and as a result courts have] granted relief on several writs of habeas corpus, finding that each case involved a presumptive violation of due process.” Ex Parte Turner, 394 S.W.3d 513 (Tex. Crim. App. 2013) (per curiam); Ex Parte Hobbs, 393 S.W.3d 780 (Tex. Crim. App. 2013) (per curiam). The Texas Court of Criminal Appeals (“CCA”) has since “retreated from a presumption that due process was violated in every Salvador case, [instead] requir[ing] a showing of falsity and materiality.” Ex Parte Coty, 418 S.W.3d 597, 605. In order for a defendant to prove that due process has been violated, the defendant must show (1) falsity—that his evidence from the lab or lab report was falsified; and, (2) materiality—that such falsifications/false reports were material to the outcome of the guilty verdict. Ex Parte Weinstein, 421 S.W.3d 656, 665 (Tex. Crim. App. 2014). The defendant bears the initial burden of showing falsity; the CCA “has implemented a five-part protocol to be used when a [defendant] raises an inference of falsity.” Coty, 418 S.W.3d at 605. The technician handled and processed the evidence in the [defendant’s] case within roughly the same period of time as the other misconduct. A defendant bears the burden of persuasion with regard to materiality. Id. at 606. Materiality of false evidence is measured by the impact it had on the defendant’s decision to plead guilty. Id. In cases involving plea agreements, the court examines the voluntariness of the plea—whether there is a reasonable likelihood that [the plea] affected the defendant’s decision to plead guilty, [but] not whether it affected the conviction or sentence. Id. The Court ponders questions like, “if the defendant had known that the lab reports were falsified, would he have plead guilty, or would he have gone to trial?” A plea, however, is not involuntary simply because a defendant does not correctly assess every relevant factor entering into his decision [to take the plea]. Ex Parte Evans, 690 S.W.2d 274, 277 (Tex. Crim. App. 1985); Brady v United States, 397 U.S. 742, 757 (1970). The CCA implies that the decision to “go to trial” is an indicator that the false evidence is indeed material; the decision to “take a plea deal” is a soft indicator that the false evidence is not material. On March 13, 2009, Kemos Marque Barnaby was stopped for a traffic offense. During the traffic stop, police smelled an odor of marijuana coming from inside the car. Barnaby was asked to exit the vehicle, and he consented to a pat-down search. With dashboard cameras rolling, a small plastic bag with white rocks, which tested positive for cocaine during a rapid field test, was found in Barnaby’s pants. The bag was delivered to the Houston Crime Lab, where Jonathan Salvador issued a drug analysis report, identifying the white rocks as cocaine. Instead of going to trial, Barnaby plead guilty to four separate offenses of possession of a controlled substance with intent to deliver in exchange for four concurrent fifty-year sentences. Barnaby appeals to the Court of Criminal Appeals, arguing that because of Salvador’s false report, his guilty plea was involuntary, and had an impact on his decision to take the plea deal. Here, the Court examines falsity to determine whether due process was violated. Using the five-part falsity protocol, the Court says, (1) Salvador was a state actor; (2) Salvador had multiple instances of misconduct; (3) Salvador worked on Barnaby’s case; (4) Salvador’s misconduct is the type of misconduct that would have affected the evidence in Barnaby’s case; and, (5) Salvador handled Barnaby’s evidence in the same time period as the other misconduct at the Houston Crime Lab. The State conceded that Barnaby was able to raise the inference of falsity, and accordingly the Court infers that Salavador’s report in this case is false, carefully noting that an ‘inference of falsity’ is not an affirmative finding of a negative cocaine test result. Even though the Court infers “that the laboratory report in [Barnaby’s] case was falsified, [the Court] finds that [such] falsity was not material to [Barnaby’s] decision to plead guilty,” adding that he received a benefit of a lighter prison sentence by choosing to take the plea deal. Accordingly, the Court of Criminal Appeals denies relief to Barnaby. We’ve recently seen experienced drug lab problems in Fort Worth as well. The problems have impacted countless drug and DWI cases in Tarrant County. Any case that involves an outside crime lab must be scrutinized carefully by the criminal defense attorney. While bad lab techniques (or technicians) might not mean an acquittal, but it could mean considerable relief for the defendant.